In his first China show, exciting French creative Céleste Boursier-Mougenot is set to prove his lifelong belief that just about anything can be music. Known for making finches play guitars (kind of) and vacuum cleaners play harmonicas, the artist’s signature exhibition, SONSARA, at Minsheng Art Museum explores how humans interact with nature. 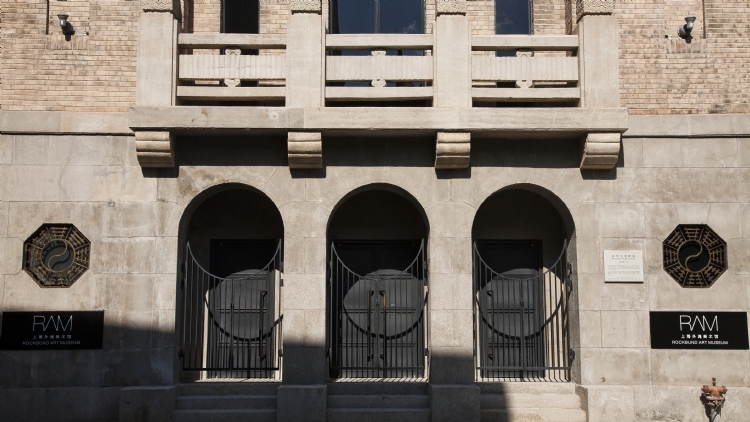 After training for a musical career at the Conservatoire National de Nice, Boursier-Mougenot worked for over ten years as a professional composer, before turning his ear to art installations in 1994. 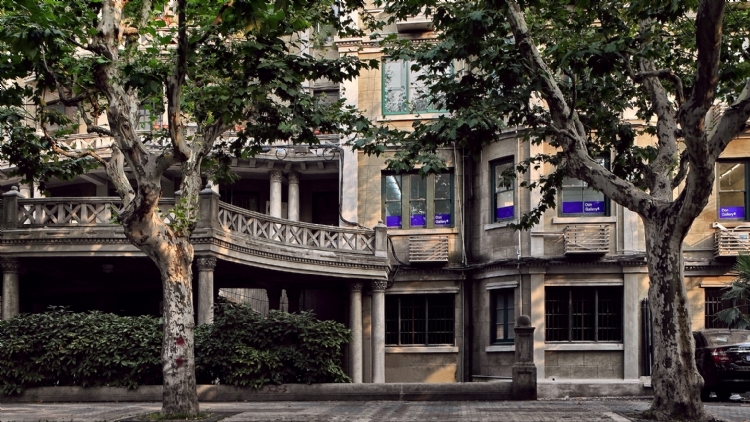 His Shanghai exhibition features six large sound installations in combination with moving images and impressive sonic processing. Aiming to capture the diversity of sound, the show promises to ‘guide the audience through a futuristic world of noise’. And boy, does it deliver. 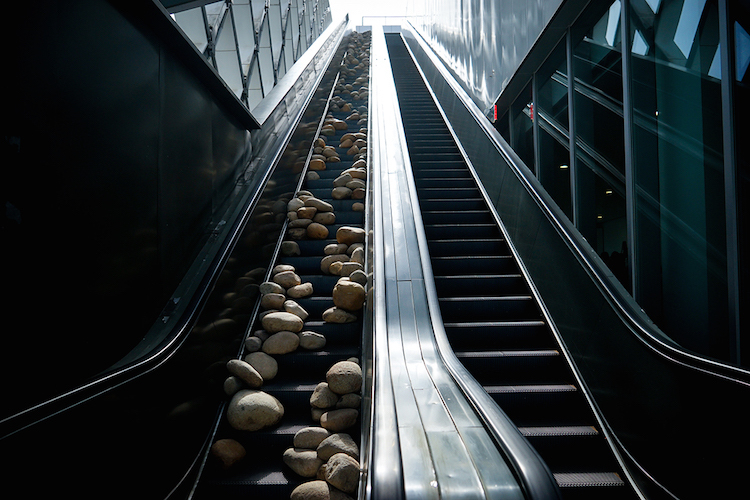 The exhibition begins outside the museum, with two escalators side by side, one of which is covered in hundreds of pebbles. It’s a unique and striking installation juxtaposing the natural world with manmade machinery that literally forces you to slow down and contemplate how the two worlds collide before entering. 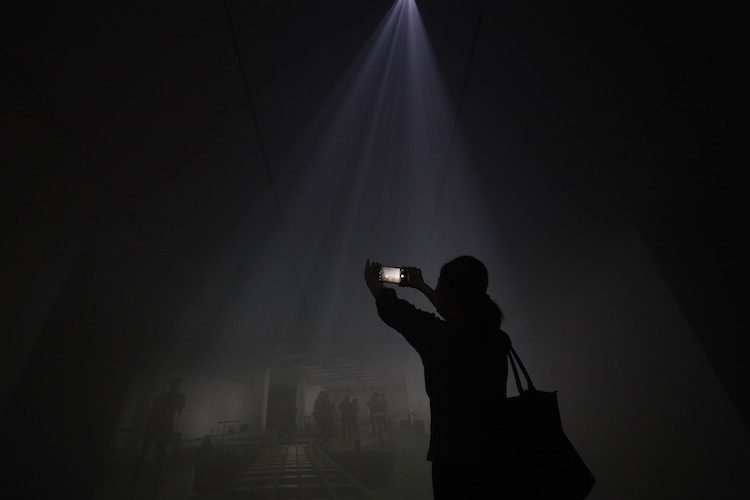 Visitors are then guided through a dark fog-filled space buzzing with a faint industrial noise from another room and mirror-like projections of mysterious silhouettes on the walls that foreshadow the fascinating installations to come. 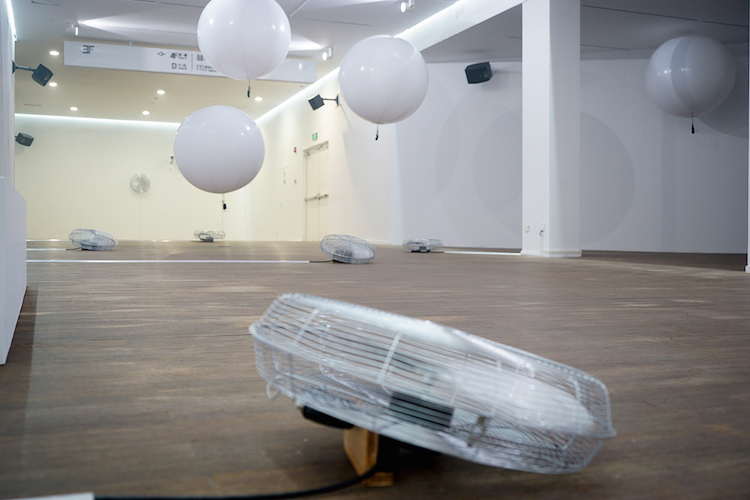 The next room is the home to ‘Scanners’, a piece featuring large helium balloons floating in the breeze created by electric fans with wireless microphones attached underneath. The microphones are used to detect and amplify random ambient sounds of airflow. 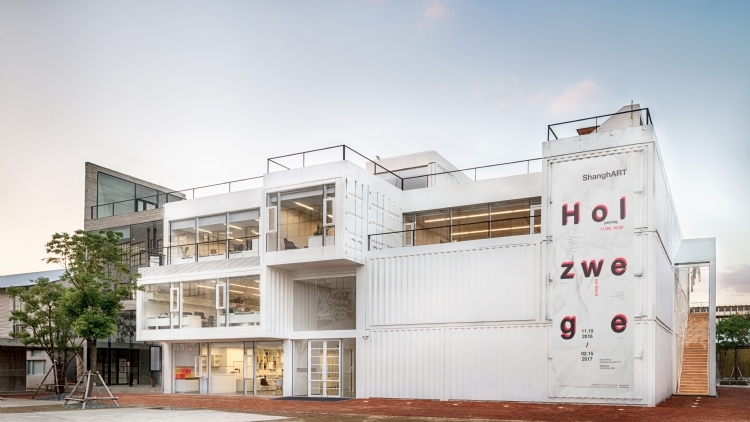 By this stage, the inventive multimedia exhibition already has our undivided attention, but the stars of the show are still waiting in the wings. As we step through to a large bright white room, we’re greeted by fleets of tiny birds swooping towards us, and it takes a minute to recognise that: a) they are real, and b) they’re just doing whatever they damn well please. 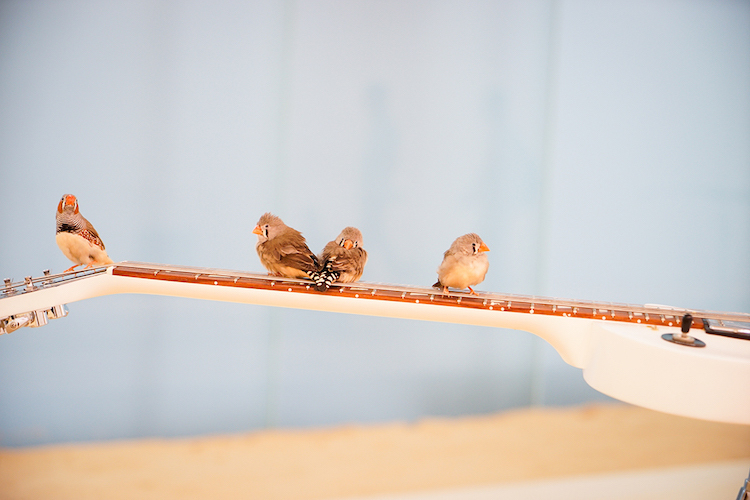 There are 168 zebra finches in total, zooming between strategically placed electric and bass guitars and amps. It’s Boursier-Mougenot’s hope that the birds landing on the strings will create the experience of listening to live performances in nature. 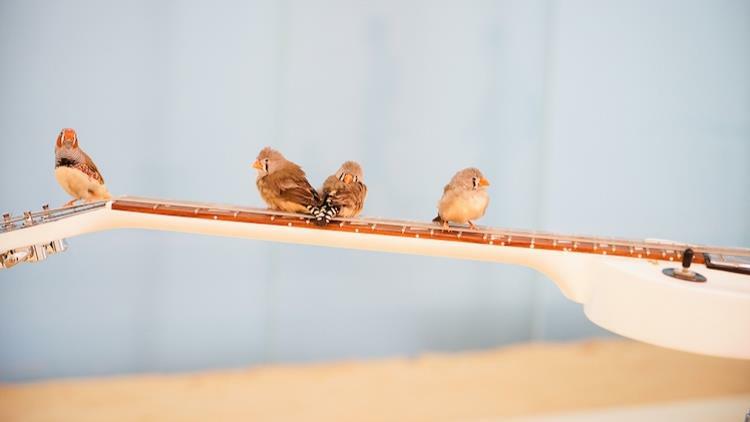 It kind of works, but you get the sense the birds haven’t been adequately briefed on what exactly they’re meant to be playing – they’re just wingin’ it if you will. Despite the somewhat overwhelming noise combination, the installation is utterly mesmerising. 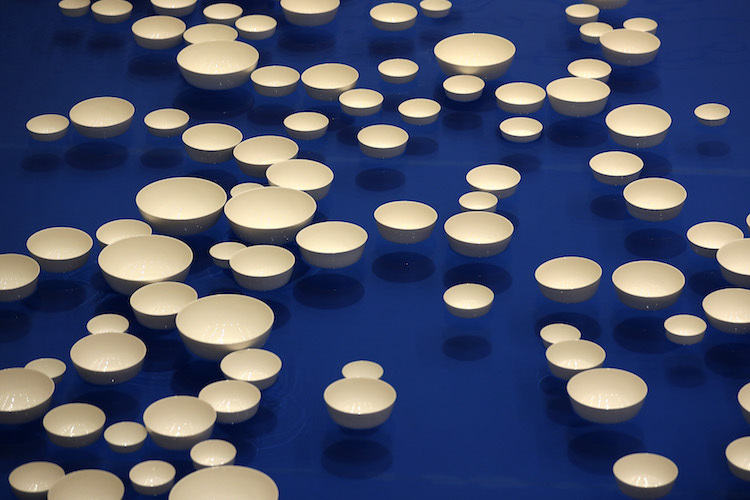 If you can tear yourself away from the bird show, the final installation room stages two hundred white porcelain bowls floating in a pool of water. The flow of the water is controlled as such that when the bowls touch, the beautiful, delicate sound reverberates around the entire hall. In a city that thinks it’s seen it all, Boursier- Mougenot’s works are as refreshingly alternative as it gets.